Original publication date: Wednesday March 26, 2003. In this image, we see a supermassive black hole (thought to power quasars) with its accretion disk -- gas from stars flowing into the black hole. Wind generated by the black hole (due to radiation pressure) can blow material away from the accretion disk, which was once thought to be a one-way ticket into the black hole. Supermassive black holes, notorious for ripping apart and swallowing stars, might also help seed interstellar space with the elements necessary for life, such as hydrogen, carbon, oxygen and iron, scientists say. Using NASA's Chandra X-ray Observatory and ESA's XMM-Newton satellite, scientists at Penn State and the Massachusetts Institute of Technology found evidence of high-speed winds blowing away copious amounts of gas from the cores of two quasar galaxies, which are thought to be powered by black holes. "The winds we measured imply that as much as a billion suns' worth of material is blown away over the course of a quasar's lifetime," said Dr. George Chartas of the Penn State Astronomy and Astrophysics Department, who led the observations. The winds might also regulate black hole growth and spur the creation of new stars, according to the science team, which includes Drs. Niel Brandt and Gordon Garmire of Penn State and Dr. Sarah Gallagher of MIT. These results are presented today in a press conference at the meeting of the High Energy Astrophysics Division of the American Astronomical Society at Mt. Tremblant, Quebec. Different from high-speed jets shooting off subatomic particles, the newly identified gusts arise from the disk of matter orbiting the black hole, called the accretion disk, once thought to be a one-way ticket into the black hole. 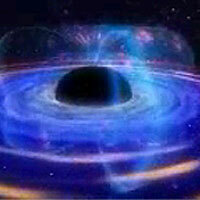 Black holes are objects so dense that nothing, not even light, can escape their gravitational attraction. But this only applies once matter crosses the theoretical border of a black hole, called the event horizon. Outside the event horizon, the tug of gravity is strong, but matter and light can escape. Theorists have suggested that a wind could blow away material from its accretion disk and pepper the interstellar region with heavier elements. The wind is created by radiation pressure, analogous to earthly winds created by varying high and low air pressure systems. Chartas and his colleagues observed two quasars, which are exceedingly distant star-like objects thought to be the bright cores of galaxies fueled by a supermassive black hole. With Chandra, the team observed a quasar called APM 08279+5255; and with the European Space Agency's XMM-Newton, they observed a quasar named PG1115+080. Both quasars are billions of light years away from Earth. However, APM 08279+5255 was naturally magnified by a factor of about 100 and PG1115+080 by a factor of about 25 through a process called gravitational lensing. Essentially, their light, while en route to us, was distorted and magnified by the gravity of intervening galaxies acting like telescope lenses. With the natural boost in magnification, coupled with the X-ray observatories' abilities, the scientists could ascertain several key properties in the quasar light, such as the speed of the gas that absorbed the light, as well as the material's proximity to the black hole. The team found the first observational evidence of a wind component transporting a substantial amount of carbon, oxygen and iron into the interstellar and intergalactic medium. The wind was moving at 40 percent light speed, considerably faster than predicted. Brandt said the observation may spur new theoretical work about black hole winds and their effect on their environs. For example, Brandt said, "the wind might provide insight to the relationship between black hole mass and the central bulge of its host galaxy." Chandra, launched in July 1999, is the third in NASA's Great Observatory series, a sister craft to the Hubble Space Telescope. ESA's XMM-Newton was launched from French Guiana in December 1999 and carries three advanced X-ray telescopes.